The tale of Saddle Peak Lodge begins over 100 years ago, when it was constructed as roadhouse, nestled deep in the hills surrounding Malibu. In the 1920s, the Lodge evolved into a retreat for the Hollywood crowd, a home away from home for the luminaries of Tinseltown. It was only in the post-WWII era that the Lodge began to transform into the fine dining establishment it remains today. 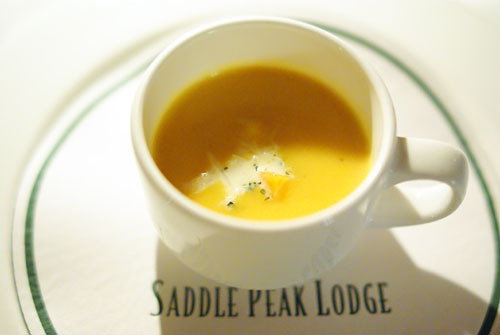 Throughout the years, Saddle Peak has seen a steady progression of chefs. Josie Le Balch of the well-known Josie restaurant in Santa Monica once helmed the kitchens here, brought in by owner Ann Ehringer to clean up the place in 1995. So did Alex Scrimgeour, of the ill-fated Alex on Melrose (at the site of the new Hatfield's), who came in 1998 and left in 2001. Next was Warren Schwartz, who eventually moved to Santa Monica's Whist at the Viceroy in September 2004; Schwartz, of course, recently opened up the popular Westside Tavern at the Westside Pavilion. Schwartz's sous chef Mark Murillo (ex-Café Pinot) took over for a while, lasting until fall of 2006. Enter Argentinean and Patina and TRU alum Steven Rojas, who successfully garnered a Michelin star for the Lodge in the guide's inaugural ranking of Los Angeles restaurants. Rojas, however, left in July 2008 for El Bizcocho at the Rancho Bernardo Inn in San Diego, taking his star with him (he replaced Gavin Kaysen, who moved to Café Boulud in NY). 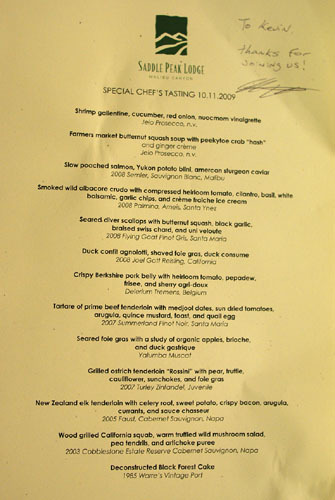 Rojas' "molecular," degustation-only menu failed to catch on with the City's conservative diners though, and was asked to leave in May 2009. As of late June, it appears that Rojas is still looking for a new gig. With Rojas out of the picture, it was time for his sous chef, Adam Horton, to shine. Horton, interestingly, actually started his professional career as a line cook at the Lodge, working under Warren Schwartz while attending Le Cordon Bleu California in Pasadena. 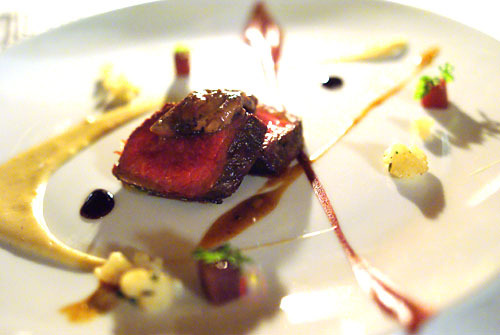 Horton graduated in 2004, and then moved to Europe, staging across a constellation of Michelin stars at Gordon Ramsay on Royal Hospital Road, Le Moulin de Mougins, La Palme d'Or, Taillevent, and Troisgros. Horton returned to the States in 2006, landing briefly at Josiah Citrin's Melisse before circling back to Saddle Peak. It is Horton himself who I have to thank for this meal. A reader of this blog, he emailed me a few weeks ago, inquiring if I'd be interested in a complementary tasting of the restaurant's revamped menu. 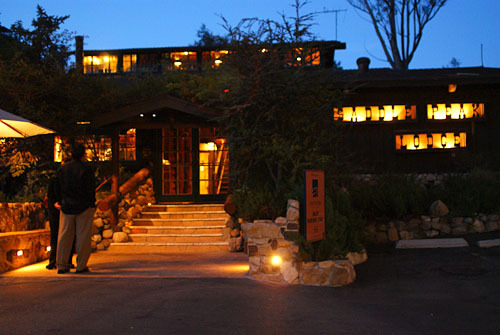 Of course, I was interested, very interested in fact, as Saddle Peak Lodge had been on my radar screen for some time. Joining me were Ryan of Only Eat What Feeds Your Soul and Will of FoodDigger. After a long, winding, occasionally scary drive up mountainous two-lane roads, I arrived in front of the Lodge, which looked exactly as I thought it would. The only form of parking is valet, which seems a bit silly given the location of the place (the middle of nowhere). The lone valet, to his credit, performed his duty superbly however, and was quite personable to boot. Inside, it was also exactly as I'd expected. Above, we see the main dining room, reminiscent of a rustic log cabin, and filled with a variety of trinkets and tchotchkes, baubles and kitsch, the infamous stuffed animals heads, and other "objects d'art." It was dark, but comfortably, cozy even. In addition to this space, there are also several private dining rooms upstairs. 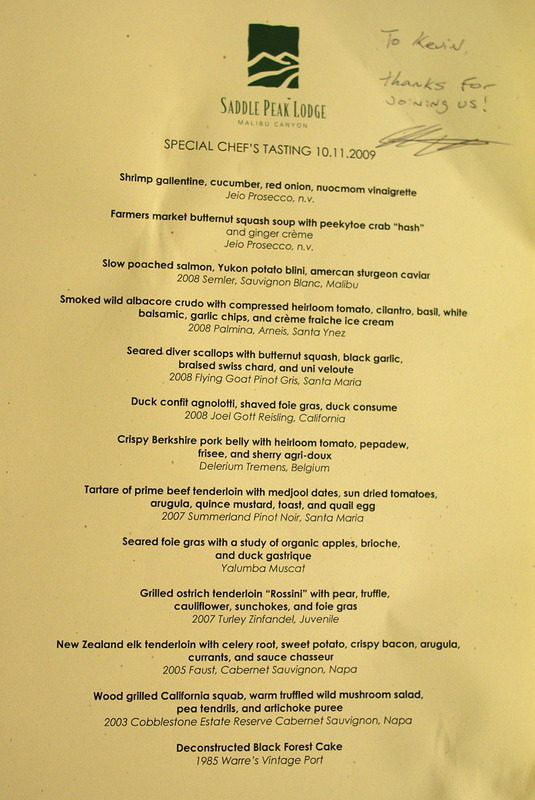 For this very special dinner, Chef de Cuisine Adam Horton and Sous Chef Chris Kufek prepared a 13-course extended tasting menu (replete with a couple experimental dishes thrown in), while beverage pairings for each and every course were provided by Wine Director Joshua Buckner. Click for a larger version. Two breads were provided: a sourdough, and a much more interesting rye bread, which we thought was spiced up with caraway and aniseed. 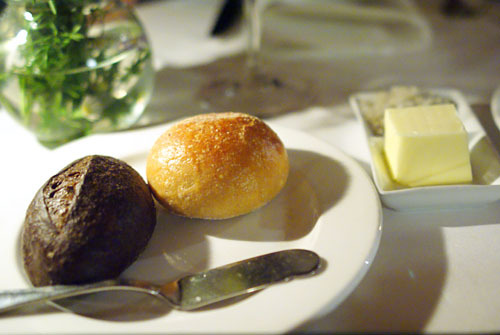 Butter was served in square form--suitably soft, sweet, and scrumptious--while sea salt was also supplied. Right off the bat, Horton shows that he's not afraid to experiment with Asian flavors. The centerpiece here was the galantine, a type of charcuterie in the form of a disk of minced shrimp. It effectively demonstrated the light, delicate sweetness of the crustacean, reminding me of chao tom in fact. 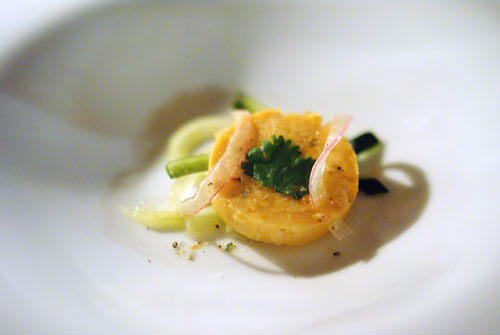 The onion and cucumber of course provided a refreshing vegetal accent and crunchy textural element, but the key was the nuoc man (fish sauce), which turned the amuse to a perfect combination of sweet, savory, and sour. The nuoc man elevated, integrated, and punctuated the shrimp, effectively conveying the quintessence of Vietnam without going overboard. Superb. For me, butternut squash soup tends to express the season of autumn and the coming of winter. The example here was expectedly sweet, perhaps a touch too much so, though quite rich and heartwarming. I appreciated the application of the crab and the salty potato especially (a superb textural contrast as well), but I would've liked more to offset the monolithicity of the soup. No messing around here: a classic flavor combination to be sure. The poached salmon was creamier than usual, accented by a pinch of smoked Maldon sea salt. The fish's briny essence was further heightened by the smack of the caviar. 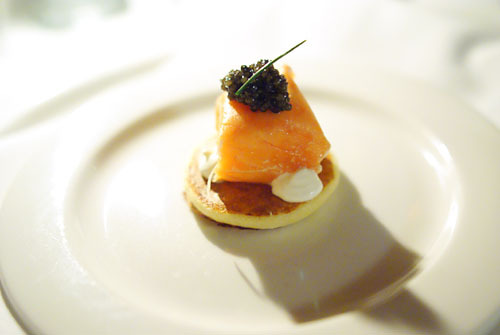 However, the blini and crème fraîche effectively tempered the combination, forming a well-balanced complex of savory and mild flavors. And now, our first "real" course. I enjoy a good albacore, but I felt that there was a bit too much going on here. The main culprit was the tomato, which lent an overarching sweetness to the dish that overwhelmed the fish's intrinsic flavor, as well as most of the smoking imparted. The crème fraîche had a similar effect, in addition to providing a rather jarring temperature contrast. The coriander and basil did help temper things, but overall it seemed like less would be more here. 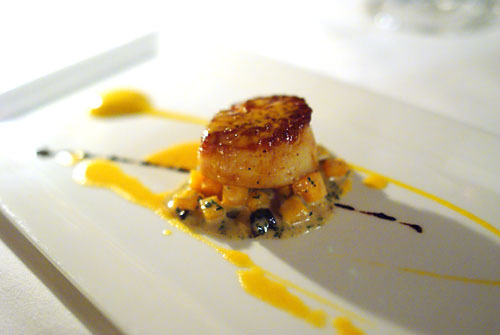 This was a perfectly cooked scallop, superbly firm yet pliant in body, with a flavor simultaneously sweet yet subtly briny, accented by a beautifully caramelized char lending a savory tang--I would've been happy eating the scallop just by itself. I did appreciate the slight sweetness provided by the uni, but found that the squash tended to dominate the bivalve's natural sapor. 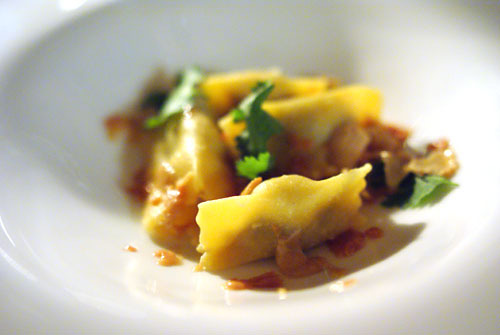 Next came one of Horton's experimental dishes, which I'm happy to report was arguably my favorite of the night. 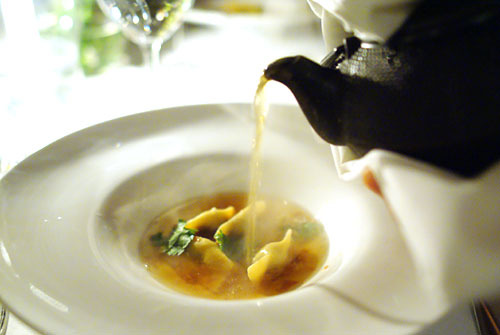 The duck agnolotti looked safe enough, but the broth, poured tableside, was the crux here. Immediately, we inhaled its heady, intoxicating aroma, and noted a striking resemblance to pho broth. Indeed, Horton would later reveal that he used coriander, anise, and cardamom in it, thus taking us back to Vietnam for a bit. 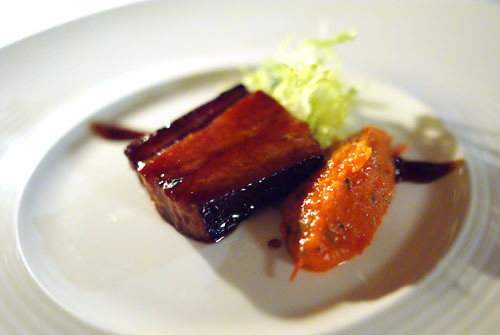 The confit itself was everything you'd expect: rich, savory, fatty, and absolutely delicious. Its flavor was utterly countered by the cilantro, and the broth tied everything together perfectly. This was something I could just eat a whole big bowl of! Is it just me, or has pork belly been done to death? I suspect that it has, but nevertheless, I rather liked this preparation. Belly can often times be overwhelming in its unctuousness, but here it was quite palatable on its own, possessing a good ratio of lean-to-fat, and a nice crispy char. 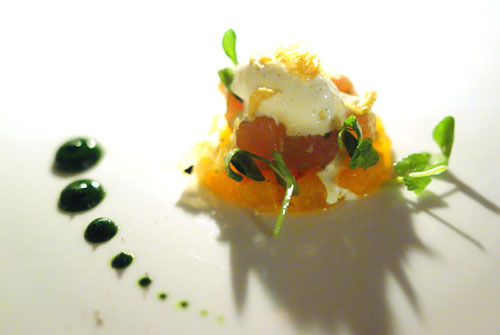 Its sweet & sour & savory flavor was tempered by the frisée, while the tomato heightened its sweetness. 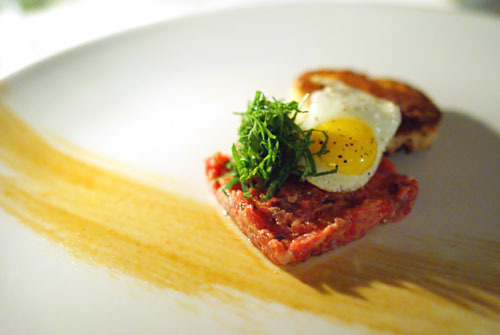 I can't resist a good steak tartar, so I requested that this dish be added to the menu. The first thing I noted was that the beef was quite sweet from the dates, and spicy from the mustard; I would've preferred a stronger beefy taste, without the accoutrements mixed in. Despite that, I did appreciate the quail egg, which added an enveloping creaminess to the dish, as well as the brioche, acting as a mitigating element. 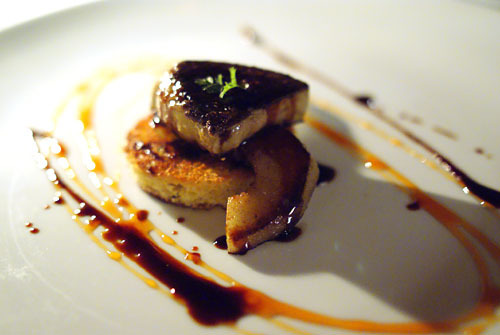 I'm generally wary of seared foie gras these days, but this was alright. The liver alone was very heavy, very rich, very powerful, and was definitely in need of a temper; the brioche fit that bill nicely. But much to my surprise, the apples didn't result in the dish being too sweet; instead, they actually diminished the foie's potency, which I appreciated--they were really the key to this course for me. This was only my third time having ostrich, and my first in California (both other times were in Colorado, at The Warehouse in Colorado Springs then at Mizuna in Denver). The cut this time was the so-called fan filet from the inner thigh, the most tender, choicest cut of the bird. It looked remarkably like beef, and flavor-wise, it wasn't too far off either--a leaner consistency than beef, with a touch of gaminess--some have compared it to bison. In any case, the ostrich was quite delicious on its own, and while the foie wasn't absolutely necessary, it did add some fat to the bird. Squab generally pleases me, and this was certainly no exception. The wood-grilling gave the bird a delectable smoky, wild flavor that I really enjoyed. 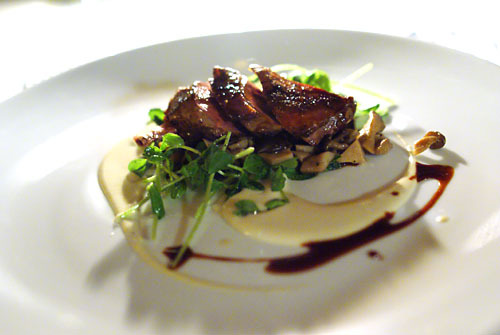 The squab's depth was superbly countered by the tangy pea tendrils, while the mushrooms added a great earthiness to the amalgam. Very nice. Elk is definitely not something I nom on regularly; the last time I had it was about a year ago at Studio at the Montage. Here, the celery was the ticket, its unique tang appearing on the attack and lingering on the palate, effectively balancing the rustic, toothsome flavor of the meat. I also appreciated the tenderness of the elk, and how the contrasting flavors of the Chasseur and currants worked with it. Seemingly taking a page from the Michael Voltaggio playbook, our last dish was a new creation from the chef, his own reimagination of the classic Black Forest cake. Traditionally, the dessert consists of layers of Kirschwasser-kissed chocolate cake, separated with whipped cream and cherries. Horton's deconstruction adds pepper to the black cherries, substitutes vanilla ice cream for the whipped cream, and turns the Kirsch into gelée form. I loved the dense consistency of the cake and its delicately sugary flavor, as well as how it interacted with the cherries, which gave the chocolate a peppery finish. The ice cream, meanwhile, did a great job in tempering the jamminess of the fruit, while adding a cold temperature contrast as well. The final piece of the puzzle was the gelée, which added a fitting textural contrast, and gave the dessert a bit of an alcoholic burn on the finish. 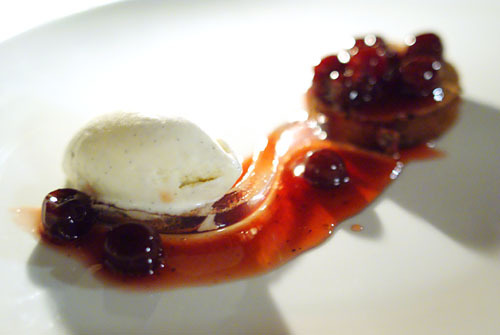 Overall, a great dessert that really captured the essence of Black Forest cake. Coming into Saddle Peak, I'll admit that I was expecting big cuts of game, questionably dressed in heavy, overly-saccharine sauces. However, what I got was so much more than that. The young chef (just 26) has livened up the game-centric menu with all that he's gathered from his experiences and travels. The end result is cuisine that's surprisingly refined--inventive, creative, and adventurous tastes and techniques appear in flashes of brilliance--while still remaining true to the Lodge's rustic roots. It's unfortunate that Michelin chose to leave this year, as I think Horton would've had a good shot at earning that étoile back. Omg omg omg!!!! SPL is my favorite restaurant in all the land! My insomnia tonightis rewarded by reading your beautiful review, looking at your stunning pictures & watching you use the term "monolithicity". As usual, your reportage is perfection. I like to think I can taste remains of the presence of Alex & Josie (2 of my favorite chefs) everytime I dine there. 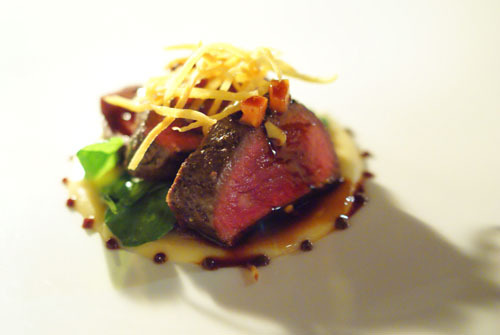 What a wonderful experience...the squab & elk in particular look fantastic. I usually order the game trio when dining there...I now have a craving! Saddle Peak Lodge looks FANTASTIC. Thanks! "Chao tom" and "nuoc mam" you say? I've never encountered such familiar goodness in a fine dining atmosphere. Sounds cool! I thought you were supposed to have 13 courses? It seems a bit odd that with 3 amuse and 9 savory you'll get 1 sweet. Granted that the whole meal was on the house it just seems a bit disproportionate. Jo: I'm really surprised you haven't been yet. I say it's definitely worth a try--definitely not all game. Cathy: Me neither. Needless to say, I was pleasantly surprised, especially at a place with Saddle Peak's rep.
jeco: I was counting the three amuses in the 13. I do agree though that one more sweet course would've been nice. Oh, my favorite discovery of the night was the Q Cumber cocktail... I could drink this allll night! Did you get to try anything off the cocktail list? I didn't get to try any cocktails unfortunately, since they were keen on giving us the wine pairings. It was super dark in there though, and I really struggled with the photos as well. You had El Bizcocho under Rojas? It is too bad, but I thought that the problem was that Rojas' food was too progressive for the traditionally staid SD clientele. I actually went to a beer pairing luncheon at Saddle Peak recently and to be entirely honest, it was one of the more memorable lunches, if not dining experience, that I have been able to enjoy. With each visit the experience truly gets better and better. One of an EXCEPTIONALLY few restaurants where a dish can consist of every ingredient I typically detest and I've still loved it. The plating is gorgeous, the pairing of flavors is something you would have to experience to understand, and honestly, the "gamey" rep is overplayed... So good. Thanks for that update Rachel! What were the beer/food pairings that you had? we've done two beer luncheons. One was belgian style ales with a redux of bar food. i.e. "fish+chips" with blanche de chambily white, "chili con carne" with Allagash Curieux. The second was American craft beers and the food was more designed around the flavor profile of the beers rather than the beers paired after the menu. Sounds great Adam! Any beer pairing planned for dinner tomorrow? I just had a great meal there. Looks like you did too! Danny, how did that meal come about, since it wasn't exactly a media dinner? Who else went? I went with SavoryHunter's party as he organized the dinner. It definitely wasn't a media dinner, but we definitely had a special tasting. A great start for me in 2011 for sure!